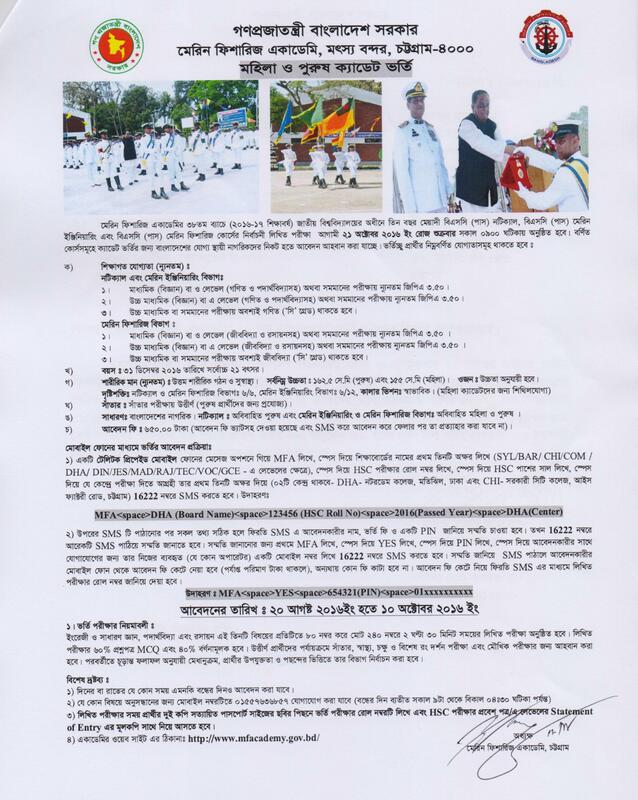 Marine Fisheries Academy Admission Circular & Result 2016-17. The Bangladesh Marine Fisheries Academic Admission 2016 Details find at Our Website as well as www.mfacademy.gov.bd. Marine Fisheries Academy has invited to Girls and Boys to application for admission to 38th batch, 2016-2017 academic sessions under National University. The application process has been started on 20 August 2016. The last date of application is October 10, 2016. It is 3rd years pass course under National University with the subject- Marine Nautical (pass), Marine Engineering (pass) and Marine Fisheries (pass). Applicants can apply Teletalk prepaid mobile through SMS. Application fee taka 650/- only. Admission test will be held on 21 October 2016 at 09:00am. See all details information including qualifications, subjects, and application and admission process from the circular here. For any kind of assistant, the student can contact 01557636857.